As a teen, Siegel wanted to be a model, so she advertised her availability in the Cleveland Plain Dealer newspaper. Two up-and-coming young cartoonists saw the ad and called her, and used her as the model for a character they were coming up with for a comic book series they hoped to sell. The cartoonists: Joe Shuster and Jerry Siegel. The character: Lois Lane, the love interest of Clark Kent/Superman. The first Superman comic appeared in 1938. She continued being an artistic model, and reconnected with Siegel later, and they married in 1948. 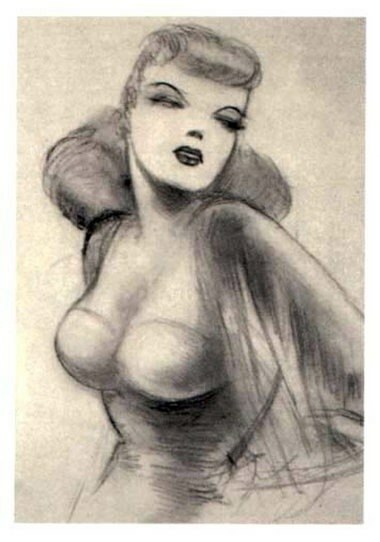 The original Siegel sketch of Lois Lane, based on Joanne. In between modeling gigs, Siegel worked to reclaim her husband’s copyright on the Superman series — in 1937 he sold all rights to Superman to Detective Comics for just $130, and was living in poverty. The legal battle went on for decades: DC Comics paid a little money to the family over the years, but it wasn’t until 2008 that a judge ruled that Siegel was entitled to co-authorship credit and royalties. But to this day, a settlement still hasn’t been reached. “All her life she carried the torch for Jerry and Joe, and other artists,” said Marc Toberoff, the lawyer representing both of the co-creators’ heirs. “There was a lot of Lois Lane in Joanne Siegel.” She died February 12 at 93. Author’s Note: The story of the Superman copyright fight is convoluted, but it shows just how valuable Intellectual Property can be.